James Harding was born at Skelton-in-Cleveland in 1886 to Francis (Frank) and Mary (nee Constable). His father was from Hutton-le-Hole, whilst his mother and all of his siblings were born at Skelton. All together, the couple had nine children but, unfortunately, one child died in infancy. In 1911 the Harding family was joined by their uncle, James, who came to live with them. Uncle James worked alongside Jame’s father as a miner in the local coal mine. This family appears to be a family of miners as James himself also worked as one during this time; he worked at the iron face, mining the ore that would be later used to create iron. In 1915 James enlisted into the army at Richmond. He was to join the 18th Battalion of the Durham Light infantry, which was known as the Durham Pals due to the nature of the unit; volunteers were encouraged to sign up to these “Pal’s Battalions” with their friends, under the promise that they would be allow to stay in the same unit as their friends. This helped sell the war as an adventure to a foreign land with your friends and was successful in finding many new recruits for the Army. James and the rest of the Pals were sent to France 30 December 1915. Here he would fight for next 1 1/2 years, seeing such battles as the Somme. It is interesting to note about that James just qualified for the 1915 Star, only due to the fact that he arrived in France on December 30; two days before the cut off. In May of 1917, James and 18 DLI were deployed to the battlefield at Arras, the Battle of Arras had already been raging for a few weeks, and the 18 DLI were to take part in the third phase of the battle. This phase was called the 3rd Battle of the Scarpe, and the 18 DLI was deployed as part of the 31st Division. The objective was to capture the ground of Oppy Wood from the Germans. The initial attacks were not effective, and the well defended positions of the enemy made the advance hard-going. The result of this was a failure to capture the objective at a heavy cost of life. James was killed in action on 3 May 1917 in Arras France, at the age of 31 years. For his service in 1915 (all two days of it), he received the 1915 campaign Star, additionally he received the Victory Medal. 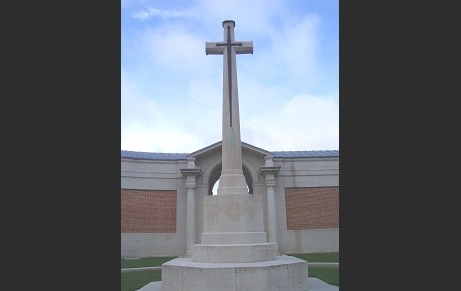 He is remembered on the Arras Memorial, which is located near the city of Arras in north eastern France, near Calais.